How Should HR and Marketing Collaborate? Marketers are the minds behind how brands create strong and intimate relationship with consumers. They know the tools and techniques on how to make a product attractive and they learn the science behind why consumers should choose to buy their product. Marketers tactically choose everything, be it the package, quality of the product, communication around it etc. Collaborating with marketing team can help HR learn on how to do employer branding & recruitment marketingbetter by promoting your brand, creating an attractive job description that tells exactly what you are looking for, getting the word out about the job openings and about the work culture of your organization. I bet this will help you learn a bit of persuasive marketing to create an interest among job candidates by not just letting them know about the job profile but also about how it’s like to work at your organization. 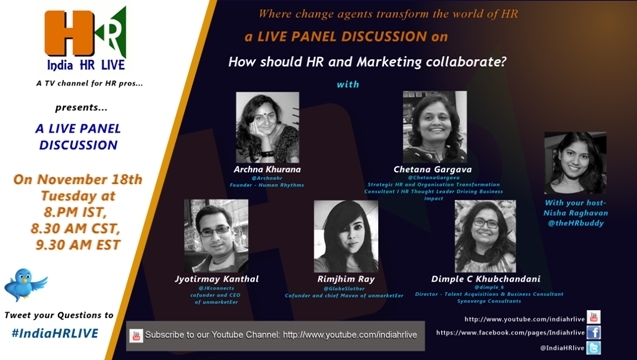 Join us while our eminent speakers, HR & Marketing experts are having a thoughtful conversation on ‘How should HR and Marketing Collaborate?’ on November 18th, Tuesday at 8pm IST / 8.30 am CST /9.30 am EST. Why should HR care about Marketing in today’s competitive world? How to leverage an innovative collaboration between HR and Marketing? What are some key skills HR must learn from Marketing and vice versa! What is stopping HR & Marketing from collaborating each other and how to fix it? How technology is bridging the gap between HR and Marketing? Click below and Watch the LIVE show here on November 18th, Tuesday at 8pm IST / 8.30 am CST /9.30 am EST. How to join us and participate during the show? Twitter Challenge : Share your selfie while tweeting. Show off your twitter skills while tweeting about India HR LIVE. Jyotirmay Kanthal, popularly known as JK, comes with extensive consulting experience across the UK and Europe, US, Africa and India in the fields of Social Media driven Business Changes in the organization, Business Growth and Sustainability, Business Transformation and Human Capital Management for more than 11 years. He has played various lead roles for the organizations such as IBM, TCS and ITC. He has been a key member in business transformations for the clients from utility and energy sectors, in manufacturing industries, in FMCGs and PSUs across the globe. He is a graduate in Statistics from the University of Calcutta and holds a Master Degree in Computer Applications from Jadavpur University. He is a registered PRINCE2 practitioner from the APMG, UK. On the other side he is a travel fanatic, photographer and food lover. He is socially aware and has a strong presence on twitter. He loves to connect with people from various walks of life. Rimjhim Ray has globally led the social marketing and strategy at TCS. She has 10 years experience in sales, marketing and program management having led global digital portfolios for Fortune 500 clients. She is an MBA – Marketing from SP Jain, Mumbai and a graduate of Jadavpur University. She holds certificates in marketing from Chartered Institute of Marketing, UK. She is an avid blogger, trekker, marathoner and a marketing practitioner. She is the mentor, speaker and columnist at several organizations including SP Jain, India HRLive (http://indiahrlive.com/), PR Moment (PRMoment.in). She is often quoted as one of the top social media influencers in the country. A passionate learner with 13 years of experience in HR, operations and Learning and Development. An IIM Ahmedabad Alumnus, blessed to became the Youngest HR Director in a Multinational company. Have always worked on HUMAN side of HR and hence the name of this venture ‘Human Rhythms’ reflects the same sentiments. Have worked with PlugHR prior to this as AVP HR operations handling clients in Four cities- Hyderabad,Bangalore, Calcutta and Delhi-NCR. Ranbaxy Labs, Siemens and Teleperformace are some of other companies leading HR. Archna is a Mother to a 4 year old, loves writing blogs and poems, avid traveler and reading is a passion. Chetana Gargava is a strong advocate of HR as serious business, which is powerful enough to become the strongest ally of the CEO in achieving orbit-shifting organizational transformation and performance; a belief that is based on her hands-on experience of having led a range of such transformations. Having worked as a corporate hr & recruitment consultant for over 7 years Dimple started her own Recruitment consultancy, Synoverge Consultants to help people grow their business by hiring right! She also volunteer an entrepreneur group and love working with startups to global giants and love learning about new businesses available. Excellent topic to discuss cause in today’s business environment hr and marketing collaboration is making the sense , in terms of business growth. I wish this discussion will come with a lots of new points which will benefit the industry. Vijay Sai B on WhatsApp as Social Recruiting Tool!! You must be kidding!!! naina on WhatsApp as Social Recruiting Tool!! You must be kidding!!! Sneha on WhatsApp as Social Recruiting Tool!! You must be kidding!!! C SURESH REDDY on WhatsApp as Social Recruiting Tool!! You must be kidding!!! Chandrakant on WhatsApp as Social Recruiting Tool!! You must be kidding!!! Copyright © 2017 India HR Live. All Rights Reserved.